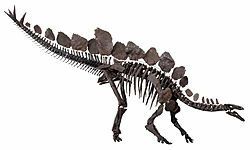 Stegosaurus is a genus o airmoured dinosaur. Fossils o this genus date tae the Late Jurassic period, whaur thay are foond in Kimmeridgian tae early Tithonian aged strata, atween 155 an 150 million years ago, in the wastren Unitit States an Portugal. This page wis last eeditit on 23 Mairch 2017, at 19:57.